Surah Al-Kausar is the shortest Surah of the Holy Quran. Here you will find the Surah Kausar in English (Translation). It will definitely help you to understand the content of this amazing Surah. 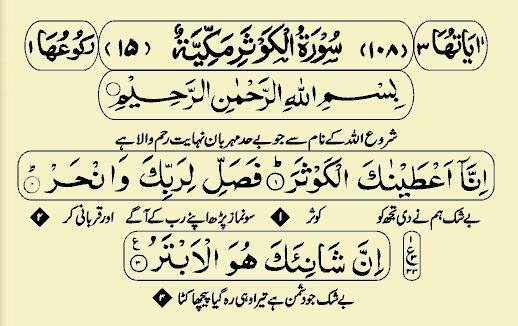 There are three Verses of this Surah. These Verses describe the message from Allah Almighty. There are a lot of benefits that can be gotten by reciting this Surah. Reciting the Surah Kausar in Arabic, is literally full of Ajr (Reward) from the Allah Almighty. This Surah is the shortest one of the Holy Quran, thus it is easy to recite it as well as memorizing it. When a Muslim recites Surah Al-Kausar, he/she creates a spiritual connection with his Lord, Allah Almighty. Allah lets the reciter be blessed with the countless blessings and rewards. So, these are the Ahadees that are about the “Fountain” named as “Kausar”. There are few other Ahadees as well, that describe about the Fountain, “Kausar”.